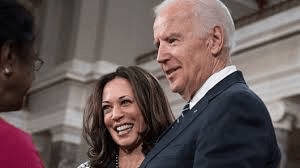 Joe Biden leads Kamala Harris in California early 2020 Democratic Presidential poll…. Biden only leads Harris by 2% points…. 58% to 60%…. But even the small lead means that Kamala Harris cannot count on carrying her home state against Joe Biden…. The rest of the early 2020 prospective field lags far behind…. She has eclipsed Bernie Sanders…. Elizabeth Warren is off to a rough start and may not be able get away from her Native American problem in the end, which will sink her chances…. On the heels of a high-profile White House campaign launch that cemented Kamala Harris‘ position as a top-tier 2020 contender, a new poll shows voters in her home state are divided on whether she would make a good president. Forty percent of voters in overwhelmingly Democratic California say the first-term senator would make a good president, and 38 percent say she would not, according to a Quinnipiac University poll released Wednesday. California Democrats and Democratic-leaning voters are just as pumped up about former VP Joe Biden running for presidentas Harris — with 60 percent saying that they’d be excited about a Biden 2020 run, compared to 58 percent saying they’d excited by a Harris presidential run, the poll showed. In Harris’ home state, “the total pool of voters is noticeably ambivalent about whether she has what it takes to be a good president,’’ says Tim Malloy, assistant director of the Quinnipiac University Poll, which launched its first major poll of California voters this week. In a state where an early March 2020 primary represents a mother lode of Democratic delegates, the poll showed “it’s former Vice President Joe Biden and U.S. Sen. Kamala Harris neck and neck, and everyone else an afterthought in the very early Democratic presidential race,” said Malloy….. The two sure would be a STRONG Democratic duo to run against Trump or any other Republican come 2020…..